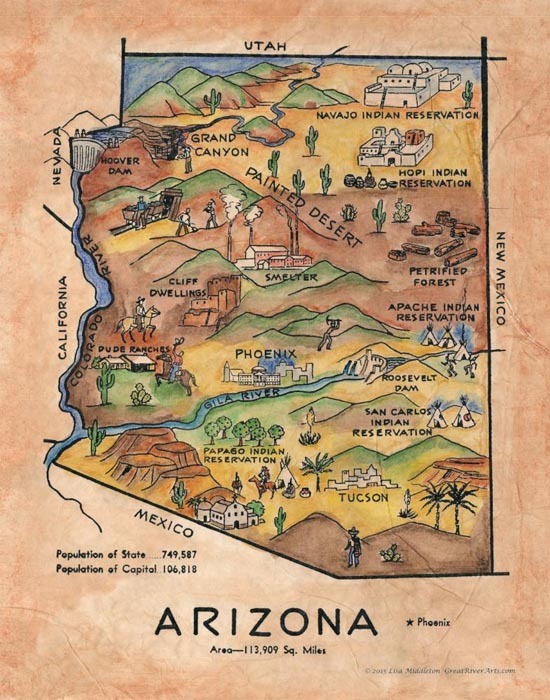 The land of the sun never looked better than here on our Kids map of Arizona. You can almost see the sun glistening off the arid desert landscape. Even though, it is still home to several indigienous peoples. The heritage and history of the state is as linear and logical as any ruler used by your elementary school teacher. Step back in time to the first accounts of Marcos de Niza, the first European explorer who went on record, and travel forward. You won’t make it very far. The terrain and conditions of Arizona made it a sole unexplored area until the early 1880s. What happened then? The railroad. As it rolled through the state, so did exploration, settlement and progress. However, progress would remain tied to the land through farming and livestock, until the mid 1940s. At that point, people from the Northeast would find their way here to enjoy warmer temps and a cheaper cost of living. Kids will love pointing out points of interest like the Grand Canyon and Painted Desert. You can help them identify the Hoover Dam and explain its important role to not only the state of Arizona, but the rest of the United States as well. You can also familiarize them with major cities and natural wonders like the Petrified Forest. Spend some time picking out native tribes and discussing the heritage of Native Americans who still live and work much like they did centuries ago. There is so much to see and explore on our map of Arizona that you will revisit it time and time again. It will inspire you to teach your children more about this great state. Who knows, it might just inspire a visit as well!